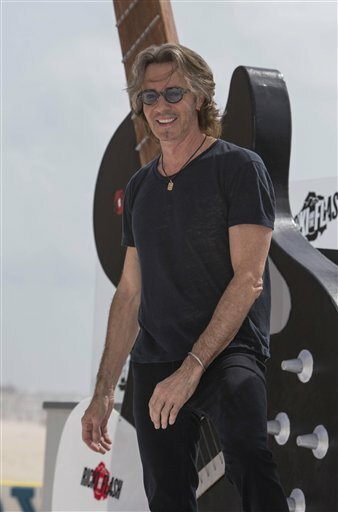 Aww, these pics from Rick Springfield’s Facebook page today are so darn cute. There have been lots of shirtless RS concert pics circulating online these past few days – accompanied with “This is what 67 looks like? !”-type of comments. Those pics are nice to look at, of course, but these dog pics are just so sweet and show a different side of my favorite rock star. RS fans know of his affection for dogs – and even the non-fan probably has an idea if they’ve seen the “Working Class Dog” and “Success Hasn’t Spoiled Me Yet” album covers. My youngest son has this natural love for dogs, too. I got my dog before I even met my husband so my kids have had a dog in the house their entire lives. The older two will occasionally play with him and pet him, but my youngest connected with him right away and just LOVES him. Once when he was about 4 or so, he suddenly started crying and when we asked him what was wrong, he said he didn’t want our dog to ever die. My youngest son befriending a dog at the park. Whenever we go to events where people bring their dogs, we end up spending a significant amount of time going up to people to ask if he can pet their dog. It’s because of RS’s love for dogs that the charity selected for the fan-based grass-roots Rick Springfield Birthday Charity Campaign is the Linda Blair Worldheart Foundation, which helps take care of dogs. According to the campaign website, happybirthdayrick.com, the total raised so far this year is $5,419, as of Aug. 25. Having all the live Rick Springfield concert streams available these past few days – both the Atlantic City show on his official Facebook page and others on fan pages – really helps with concert withdrawals. Although I didn’t actually watch the videos live because I was out on a day trip with my family and watched them later that night, the whole concept still amazes me. To be able to sit at home and watch a live concert as it’s happening still blows my 13-year-old fangirl self’s mind. It makes it really clear how our lives have changed in the past few decades. The live streams often offer a better view than you’d get if you had seats further back at the actual concert, which is fun, and you get to see little details that happen, such as a string breaking during “Jessie’s Girl” and RS improvising to get through the song. Seeing him perform live really emphasizes what an amazing performer he is. On the live streams, you can also comment throughout and it’s fun to see where some people are watching it from – last night I saw comments from Singapore and Sydney among the posts. The only downside watching from home is there’s no chance of getting any “Human Touch” or making eye contact or running into him after the show. 1. Virtual concert – similar to virtual conference calls where you hold meetings with people anywhere in the world and it looks like you are sitting at the same table, how about virtual concerts? There’ll be a place you can log in and then there will be a big screen at the concert where you can see the performer and the performer can see you, just as he or she would see those in the room. This way people all over the world can see their favorite artist in person even if the tour doesn’t reach them. And then you can enjoy the real or imagined eye contact. 2. Virtual meet and greets – This technology already exists in some form, via Skype and Facetime-type programs, so why not extend it to Meet and Greets? Maybe a virtual hug, too? Neither of these things can replace being at a live show of course, but it’s better than nothing. Thanks to RS Official and to other fans for sharing their concert experience! Sadly, people don’t often read the whole story, they just see the picture and make assumptions. And unfortunately, now that the Internet has made everyone a reporter, people assume those assumptions are true and over time they are transformed into “facts.” I’ve already seen some not very nice comments about the photo that shows that people assume that this is a current photo of RS rather than a look that took professional makeup artists a great amount of time to create. I know this Rick Springfield advocacy may seem silly – because aren’t there more important things going on in the world? – but it’s really about the big picture (no pun intended). Misinformation is spread daily online and then people act upon this misinformation, and it often turns hateful and ugly. There’s a saying that “the devil is in the details” and, in light of RS’s new role in “Supernatural,” it seems appropriate to include that message here.